When looking to Buy a Home in Chennai in our twenties, the scope of house prices can feel depressingly prohibitive. In our twenties, one of the last things on our mind is often saving up to buy property. Previously, in saner economic climates, it was possible for a young couple with ambitions to invest in a property without putting themselves under excessive financial pressure. Today, though, the global economy requests that young people take precautions from an early age to be ready to purchase a home when the time comes. Improved financial security – if you start to save now, you’re less likely to be caught in a trap later. Less stress – while most people your age are living month to month, you’ll be building towards a plan. Greater opportunity – when you’ve got a strong financial background, you’ll be more likely to have access to take on higher quality finance options, meaning better homes are accessible. Career progress – another unintended consequence is that starting young means finding a good career to get stuck into. This becomes easier when you’ve got a home to pay for! Equity is the amount of the home that you own at present. Therefore, if you borrowed money to buy your home in your twenties then you need to subtract your loan balance from the value of your home. The more that you invest into your home, and you pay off more of the money owed, you will have a home worth more. To build equity, you need to help increase the value of your property whilst also decreasing the amount of debt that you have. While easier said than done, of course, it’s not impossible. In your twenties, now is the perfect time to begin making small changes to the home within your budget, whilst paying off as much of the debt on your home as you can. 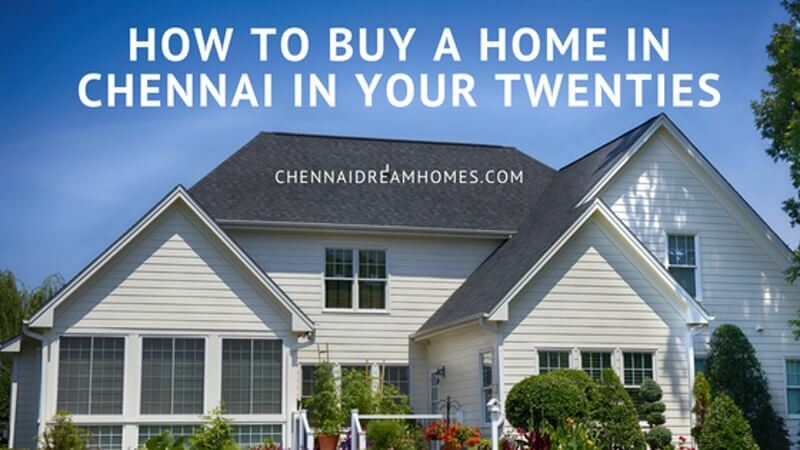 It’s a long-term process, but if you start now in your twenties, then buying a home in Chennai that you can develop and profit on as time progresses, is no longer quite so difficult. The more debt you pay off, you will build home equity when you buy which can lead to better profits in the future. Don’t shun an area in Chennai because of reputation: you can find wonderful properties in ‘shunned’ areas without too much work. Sometimes, the best value deals can lie in areas like this, so keep an open mind and then narrow down as you find any location problems. Always look to find out what’s in plan for the area. It might be upmarket today, but what’s planned in store for development? It’s the same with a rundown area; major changes could be coming. Don’t jump in too early just because you have the funding, either. Always take the time to look at all options, go on site visits with your real estate agent, and survey the homes as best you can: after all they need to fit your needs. Like making any kind of important purchase or working with any kind of specialist doctor for your health, working with the right property agent matters a great deal. When buying one of the many houses for sale in Chennai, a trusted agency can help you to make the right choice. They’ll be more aware of your financial position than you might be, and can offer credible advice to help you make the right choices each time. Just be prepared to listen to their expertise: making the wrong choice in your twenties could hamper your thirties, forties and fifties. Listen to the right kind of expertise, though, and you can avoid such problems altogether. You can find the top rated real estate agents in Chennai witha few clicks and reading online reviews and testimonials. We hope this article helped you clarify the process of buying a home when you’re young and in your twenties. If you are ready to buy and want to move in to a home soon, contact us today. We’ll be happy to set you up with shortlisted homes that suit your style, budget, timeframe, etc. and schedule personalized site visits by appointment to get the process started!